Despite the effort and deep research behind First Ladies of Running, I know there will be omissions and corrections. I'll attempt to compile them here. In each case, I'll also try to contact the individual to offer my apologies. Dalrymple, 1979. Photo by Joe Volk. Cindy won the second Honolulu Marathon (1974) and won it again in '77. 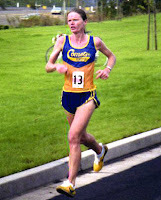 She ran her marathon PR (2:39:33) at age 39, winning the Jordache Pro Marathon (and $25,000) in LA, 1981. That was the first big publicized prize-money race to confront/defy existing amateur regulations. The next year, at 40, Cindy won the overall title at the Asbury Park 10K. 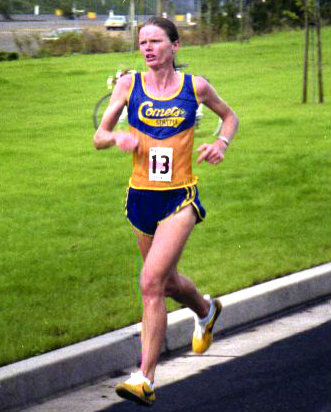 In Feb. '84, a month before her 42nd birthday, she won the National Masters 5K road title.